Ice fishing is a great way to spend your time during those long winter months. It gives you a reason to get out of the house and spend some time with mother nature and friends. All you need to do is set up your ice fishing shanty, start up your ice fishing heater and drill some hole. Having a light and efficient manual ice auger is a vital tool that you need to have while on the ice. Of course you can use a spud but we live in the twenty-first century, you don’t need to brute force your way through the ice anymore. Making sure you have the proper equipment while ice fishing can mean the difference between bring home dinner or simple spending your Saturday sitting in the cold. So if you’re on the market for the best ice fishing hand auger, here are our picks for the 5 best hand ice augers for the money in 2019. When you’re ice fishing, you need to make sure that the hand held ice auger you choose to use is up for the task. This high quality, affordable handheld auger has an extremely sharp six inch blade to help you get the job done quickly and efficiently. The Eskimo HD06 Hand Auger comes with a high quality blade protector that you can (and should) keep on it for safety and blade protection when you aren’t using it. The sharp blades on this auger are great for cutting ice, but can be dangerous when not covered with the provided blade protector. This auger requires minimal effort to cut through ice and can cut through even the thickest of ice with minimal effort. The auger extends into three different heights to make it longer so it can cut the thick ice with ease. While drilling, the handle should be at chest height allowing you to refrain from hunching over while also allowing you to use your full strength while cutting, could be the best ice auger on the market. Being hunched over while drilling can easily cause injury to your back. This augers handle has a grip to make operating it easier than its competition. This Eskimo hand auger weighs in at just 7 pounds making it lightweight and easy to carry with you while making those long treks across the ice to your favorite fishing spot or simply moving to another ice fishing shanty to put in a new hole. The Strikemaster Lazer Hand Auger is perfect for cutting through thick ice and it does so with minimal effort and maximum efficiency. 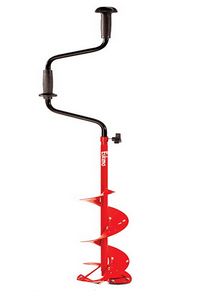 This hand auger comes in four different models: 4-inch, 5-inch, 6-inch, and 8-inch blade sizes. The larger the blade, the larger the hole will be which is something that needs to be taken into consideration depending on the type of fish you’re going after. The blades are powder coated which helps reduce ice build-up while trying to cut through the ice, not to mention it makes for a cleaner more modern look. This powder coating makes for a quicker, more effortless cut. The Strike Master Lazer comes apart into two pieces to make it easier to store and travel with. The height of the auger can be adjusted from 48” to 57” depending on your height and how deep you are cutting. You want it tall enough so that you never have to hunch over while cranking the auger. The top knob and the center handle both have soft rubber grips on them to make it easier to hold and operate while also offering amazing gripping strength. The weight of the Strike Master Lazer is approximately 5.5 pounds. It is lightweight and very portable. This hand auger cuts smoothly through the ice with precision and accuracy. With the Strike Master Lazer, you don’t have to worry about sharpening your blades, they’re razor sharp and ready to go right out of the box, this is a great manual ice fishing auger! The Strikemaster Mora Hand Auger is a lightweight, easy to use hand auger designed perfectly for ice fishing and has be said to be one of the best hand ice auger. 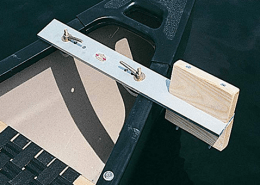 It weighs in at only 6 pounds and the height of the handle can be adjusted from 48” to 57”. This makes it ideal for those taller people so you don’t have to hunch over while drilling which can be very taxing on your back. 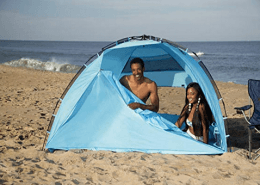 It also breaks down into two pieces to make it more portable and easy to stow away. The Strikemaster Mora Hand Auger has two soft rubber grips and an ergonomic designed handle system for your comfort while drilling into the ice. The blades are powder coated to reduce ice buildup during drilling which can greatly hinder you drilling efficiency. This hand auger comes in three sizes: 6-inch, 7-inch, and 8-inch. The auger has twin stainless steel blades which help you cut through the ice with ease and can easily be honed to a razor sharp edge. The Mora Hand Auger is heavy duty and easy to operate. It will cut through the ice smoothly and with minimal effort. The Strikemaster Mora Hand Auger is fairly priced and extremely high quality. Like many other auger this one comes with a protective sheath to help protect the blade while not it use. This is a great auger if you’re on the market for something new. The Eskimo Silvertip Hand Auger is a great tool to have when you’re out on the ice for a day of fishing and its almost as important as having a ice fishing rod and reel. It made out of steel and has a very clean and modern look and feel to it. This makes it sturdy and durable for drilling through even the thickest of ice. You can choose from a 6-inch or an 8-inch blade, depending on how big you want your hole to be and what type of fish you’re after. 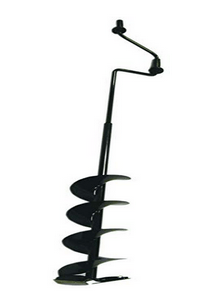 The auger comes apart into two pieces making it portable and easy to carry. The handle length can be adjusted between 49” and 58” in height. This makes it versatile for anyone to use. A key tip to keep in mind is to adjust the auger handle to be around the same height as your chest, this will make your cutting more efficient. The high carbon, stainless steel blades can cut through the ice with minimal effort. Since the blades are so sharp, it is important to keep the blade protector on your auger when it is not in use. 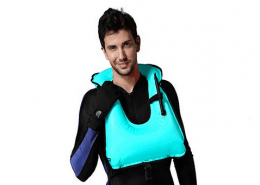 This not only helps to protect the blades, it also ensures that someone isn’t accidentally injured by exposed blades. The Eskimo Silvertip Hand Auger is very lightweight, weighing in at only 8 pounds, making is easy to take with your while venturing to your next honey hole. If you’re looking for some ice fishing hand augers, this is one you should think about getting. The HT Polar Hand Auger comes in two pieces for convenient storage and portability. 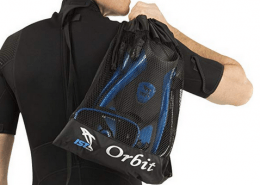 When you are going out on the ice, you don’t want to carry around a huge, heavy piece of equipment. 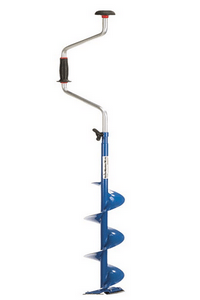 The HT Polar Hand Auger is lightweight and easy to use, coming in at only 9 pounds. The top knob and the handle both have rubber grips to make it easier to hold and operate the auger while allowing the augers cutting blades to do the majority of the work. The stainless-steel blades are razor sharp and made to smoothly and effortlessly cut straight through the ice so you can get fishing even faster. The blades are made to repel ice buildup as you drill through the ice which helps you create your holes with ease. When you are not using the auger, keep a protective cover on the blades to prevent injuries and also insuring the blades don’t get chipped or damaged. You can purchase the HT Polar Hand Auger in 6-inches or 7-inches, depending on how big you want your hole to be. The larger the hole, the bigger the fish you can pull out, so if you’re after the trophy fish you might want to grab the larger auger. 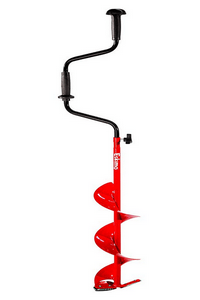 This auger is easy to handle and carry with you making it ideal for just about everyone. It doesn’t take a large amount of effort to drill through the ice with this amazing auger. If you’re going out on the ice, make sure you pick one of these up today! 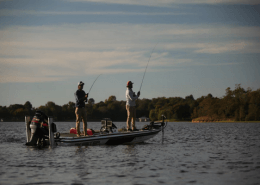 As with any spring, summer, or fall conditions outside, you want to ensure you have all the right gear for your fishing expedition, and of course, ice fishing is no exception to this. Now that fly-fishing season is over, it’s time to move into the colder part of the year, which isn’t a bad thing as this allows us to enjoy our favorite type of fishing, ice fishing! If you’re no stranger to this type of fishing, then you know how important it is to bring along the right gear. This means you need to pack something warm and get your ice fishing rods ready, don’t forget to bring along the right auger too if you plan on catching the most fish. Ice is thick and dense, so the only easy way to get through it is to drill a perfect hole with an ice auger. 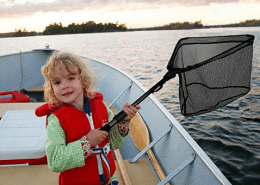 As for any fisherman, having this equipment on hand is critical. Besides, if you’re traveling a long distance, you want to drill a hole with a reliable piece of gear that won’t give out quickly. Luckily, you have many choices given the simplicity of equipment that is designed for drilling holes. So how does one choose the right ice auger for ice fishing? Well… it all comes down to a few choices: blade size, automatic powered or hand-powered auger. In case of an automatic auger, other details come into play, such as horsepower and fuel type, but we’ll cover those later. As you read below, you will get to know some of our favorite types of augers and even learn more about them, so you can find the right one that will work best for you. However, before we jump into that, let’s talk about the features of both the hand auger and the automatic auger so you can decide which one is right for you. When it comes to purchasing an auger, you must first decide if you want a manual auger or an automatic powered model. Depending on the number of holes you plan to drill, the speed at which you want to dig them, and how thick the ice is, you can easily determine the best one for you to buy. Should you go with the Manual Ice Auger? So, it probably sounds much easier to get a powered auger instead, right? Well… not exactly. Weight plays a factor in this decision because the hand auger weighs only a third of a powered one. 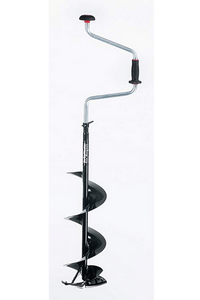 If you’re going fishing in a remote location, the hand auger seems like a good choice. Also, if you’re going catching in the early season and not going to be drilling many holes, then the hand auger will do just fine and get the job done. Another good reason to select the hand auger is if you are someone that only occasionally goes ice fishing. After all, there is no reason to splurge on an expensive power auger if you’re only going to go ice fishing just a couple of times every year. Please be aware that if you’re going to be fishing large fish species and need a hole drilled that is at least 10”, then the hand auger isn’t going to work well. In these cases, a power auger would be the best choice. Should you go with the Power Auger? For many ice fishing enthusiasts, the power augers have replaced the hand augers completely. This is because power augers have become very reliable, and they are ideal if you plan to go ice fishing quite often during winter. There are four types of powered augers: propane augers, electric augers, two-stroke, and four-stroke augers. Below we will cover each type in detail. The propane-based auger has become very popular over the last few years. 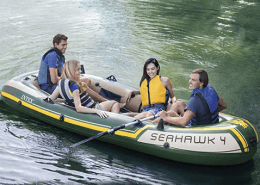 This is because it requires less maintenance, it is easier to clean and much quieter than the two-stroke or four-stroke engines. Propane-powered augers are also easy to start and have plenty of power. Battery-powered augers (also known as electric augers) are quite convenient because of their new long-lasting and powerful lithium batteries. Thanks to their design, they are quiet and efficient. If you’re drilling through a wheel-house, then you won’t find another powered auger that is as clean and quiet as this one. A two-stroke powered auger utilizes a type of engine that has been used as a power source for years. These engines run off a mixture of oil and gas and are reliable and powerful. These augers are fast and basically unbeatable compared to other models in terms of speed. They used to be the only practical choice available for those who needed a powered auger. Although their speed is fast, newer designs featuring other technologies, such as the electric powered augers, have been released on the market, and consequently the two-stroke auger has been losing some of its appeal. In addition, two-stroke augers typically require more maintenance and are more difficult to start compared to other types of powered augers available. 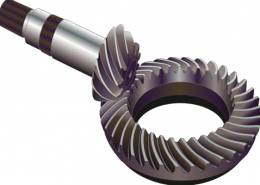 A four-stroke auger typically require less maintenance than the two-stroke auger. Also, the four-stroke auger is much easier to operate than the classic two-stroke. The newer versions of the four-stroke models cut ice somewhat better than the two-stroke, and some can even run off propane, too. In fact, if you are considering purchasing a new four-stroke auger, you’d be glad to know that it can cut ice more precisely, leaving a cleaner hole. It is also very fast too and does not produce the same smoke that you would normally get from using a two-stroke auger. The downside? These machines are on the pricier side compared to other options on the market. Ice augers can be purchased with a variety of blade sizes, with 8” and 10” blades being the most commonly used for ice cutting. 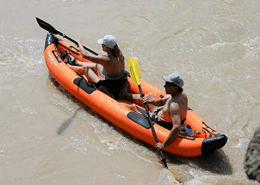 Depending on the size of fish you’re catching, blade size will vary, so keep that in mind. A bigger hole is going to help you better execute your catch! Ensuring your blades are kept well sharpened throughout the ice fishing season is very important. The number of holes you drill will determine how often the blade will need to be sharpened as well as eventually replaced. You can replace or sharpen your blades either by using a sharpening jig or going to a professional to do it for you, which we recommend because it is usually cheaper. With that said, replacing the blades of an auger is not too difficult and if you wish to learn how to do it more than likely you can find that information in your owners manual or on an online resource. The best accessory you could buy for your auger is an auger blade extension. After all, the last thing you’d want to happen while fishing on thicker ice is realize that the auger’s blades are not long enough to drill through the ice entirely. Another accessory you might want to consider is a cover for the power head of your power auger. This is because colder weather causes plastics to become breakable, and having a cover will protect the crucial components and the exhaust from breaking.